Our attention to detail ensures you'll have a day tailored to your guns and delivered with warm Willey Park hospitality. to think their experiences speak for themselves. from past days in our Gallery. 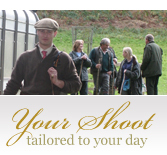 I am very proud to welcome you to the Willey Park Shoot, where our focus is on providing exceptional shooting days steeped in tradition and delivered with warm hospitality. I invite you to experience this old fashioned family-run shoot, where we have an unbroken record of shooting on the Willey Estate since 1825. In fact, the Willey Park Game Book is thought to be the longest running in England, possibly Europe. Situated in the heart of Shropshire, Willey Estate offers unspoilt, rolling countryside and the vast woodland provides challenging shooting with some of the highest birds in the country. 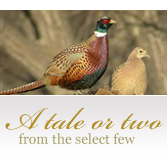 Over the last eight years I have been working with our gamekeeper to provide the best quality birds and develop a shoot that is a truly memorable experience. I look forward to welcoming you to the Estate.